Hygiene standards in the food industry are, as one would expect, stringent. Companies mass-producing food are subject to strict regulations on their manufacturing procedures and the level of quality control they employ. Nevertheless there are horror stories of people finding dead mice or other strange objects lodged at the bottom of drink bottles or in processed food. While a rare occurrence on beverage filling lines, foreign contamination is quite common in returned water cooler bottles of the type found in offices. The bottles are cleaned extensively prior to being refilled and reused, but contaminants are so varied that some form of inspection is usually required. An Australian supplier of water cooler bottles has implemented an automated system, developed by machine vision integrator Industrial Photonics, to inspect the bottles for contaminants before they are refilled. The main areas of concern were, firstly, contamination caught in the hollow handle and neck of the bottle, and secondly, checking labels to ensure the bottles belonged to the company and not a competitor. Bottles with major cracks or scuffs also had to be removed. The inspection system uses three Impact smart cameras from PPT Vision. The first camera looks down through the neck of the bottle, checking for contamination in the bottom and also identifying the bottle’s orientation from the position of the handle. The bottle then passes to a second inspection area, where it is rotated and two cameras capture images of the sides – a perspective of the handle in silhouette and a second view at 90° to the first with the label face on. Image analysis is made more complex by the fact that some scuffmarks, especially around the base, are expected and acceptable and also that the bottles are inspected immediately after being washed and so are still wet. ‘There are some false rejects with this application, where shadows or refraction from any remaining water in the bottle causes the vision system to mistakenly reject the bottle,’ says Quist. The customer is now looking to upgrade the system by adding a fourth PPT camera, this time to inspect the upper shoulder of the bottle for any algal stains. Very different from the complex, but relatively slow-moving task, of inspecting water cooler bottles, are the high-speed production lines manufacturing beverage cans. Canning lines operate at upwards of 2,000 cans a minute, which puts different requirements on a vision system. In beverage can manufacture, raw cans made of steel or aluminium are printed with a product-specific label. These printed cans then pass through ovens to dry the ink and then through a series of mechanical metal forming processes. Finally they are palletised and shipped to the customer for filling, and the sealing is closed. 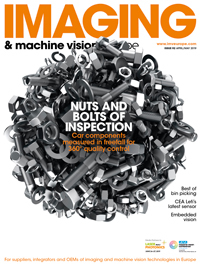 ‘One of the big problems with this process is when the batch changes,’ comments Helmut Gruber, sales manager for packaging, at German machine vision integrator Quiss. The risk is that cans from previous production runs get hooked up in the conveying system. These foreign cans are released in the bulk of the next production lot and get mixed with another label. ‘This is a big problem generally with automated palletising, packaging, shipping and filling processes,’ says Gruber. ‘A sugar-free drinks can, for example, could be mistakenly filled with the full sugar variety, potentially dangerous for diabetics and expensive for the company if the batch has to be recalled.’ Or, as Gruber notes, mixing up different language versions of the same brand is another error, and one that is potentially very difficult to spot. Quiss has developed its LSVision inspection system to sort cans into batches and identify any foreign cans that have got mixed up in the wrong production lot. The system sorts the can based on barcodes or significant features in the printed décor. It is comprised of six cameras that capture a 360°-view of the can body and uses the Matrox Imaging Library (MIL) for image processing. The system operates at speeds up to 2,800 cans per minute. Water cooler bottles are subject to various foreign contaminants, including small animals like this lizard. 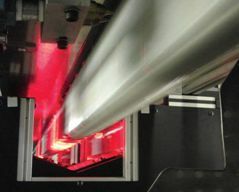 Image courtesy of Industrial Photonics. Employing LSVision allows manufacturers to run two batches in parallel, so that there’s no production downtime, says Gruber. The cans from two printing machines are mixed and processed on one production line. The LSVision system at the end of the line then separates these mixed cans at full production speed, prior to palletising. The sorting criteria can be the barcode or any significant pattern on the can. According to Gruber, production lines have previously relied on a manual checks along the hundreds of metres of production line. ‘Humans are not infallible and it’s a good idea to have a separate automated inspection system to make a final check,’ he says. The six images are then combined and analysed with the Matrox Imaging Library (MIL). ‘At these production line speeds, the image processing has to be particularly high-end and very fast,’ Gruber states. A search algorithm is used to identify barcodes or any unique aspects of the printed label. Quiss has also developed the TCVision product family, which again relies on MIL and is designed for production lines manufacturing beverage cans, lined shells and ends. Typically, different factories will be manufacturing either the can-ends or the bodies. Inspecting labels on cans and bottles is another common machine vision task. Labels are checked to make sure they are present, as well as for quality and position. Also, labelling is often carried out at a much later date than filling and vision is used to ensure product codes on the can or bottle match the label. Packaging is very important to food manufacturers as products with misaligned or damaged labels will often not sell. One major beverage manufacturer uses transparent cartons to package its bottle drinks, with the labels facing outward so that the brand is clearly visible. Orientating the bottles correctly was a task that used to be carried out by hand, but the company has since installed an automated system for loading the bottles designed by AFA Nordale Packaging Systems. The system uses Cognex Checker vision sensors to orientate the bottles before they are placed in the containers at a rate of 450 bottles per minute. Fourteen bottles are spun simultaneously, while 14 Checker sensors capture images of the labels on each bottle. The sensors send a signal for the machine to stop spinning each bottle once they have registered a particular letter, which indicates the label is in the right position. The bottles are the lifted off the belt into the carton. The machine was able to position labels within ±14 per cent of dead centre, well within the ±30 per cent requirement of the manufacturer. ‘Up to now, drink manufacturers have avoided using cartons with windows, because there has been no satisfactory solution to the problem of orienting bottles at high speed,’ says Nordale’s David Langen. The machine has been tested to 600 bottles per minute and is able to align all bottles except those with misformed sleeves.